Does it surprise you when you notice your dog eating grass? This is not unusual behavior. Many dogs like to nibble on greens from time to time yet veterinarians are not sure why. Some believe that it’s a normal part of a dogs diet because in the wild, dogs eat all of their prey including the plants in the intestines. Another theory suggests that it could be a sign of fiber deficiency. 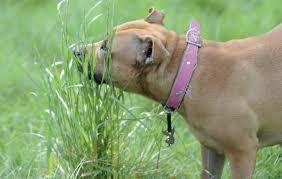 Some found that changing a dogs diet, helps end the grass grazing habit. Because dogs usually vomit after eating grass, another theory suggests that by eating grass, they are cleaning out their stomachs when they are feeling ill. We may never know exactly why dogs eat grass, but unless your dog is vomiting frequently, there’s probably no reason to worry. Don’t buy grass for him to nibble on like you would a cat but rather keep a good supply of dog treats on hand and make sure he’s on a well balanced diet. Your Summer companion is the greatest oldies playing all the time. Edgewater Gold Radio plays the best variety of oldie anywhere! The 50s through the 80s, great standards, disco and summer music! Download the free Edgewater Gold Radio app or listen on our website: edgewatergoldradio.com. This entry was posted on Wednesday, July 4th, 2018 at 8:45 am	and is filed under Pet Supplies. You can follow any responses to this entry through the RSS 2.0 feed. Both comments and pings are currently closed.